The rear rack and fenders are nice touches. The rack is solid and was easy to attach things to. The flimsy plastic fenders sometimes touched the tires. 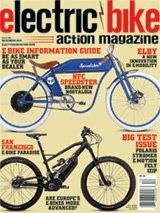 Electric bicycles are designed around the idea of sustainability. Some take it a step further and build a system from the ground up so that it can be upgradeable too. The eProdigy brand started as a partnership between Jimmy Chan, a Canadian engineer and inventor who created and patented a unique, coaxial mid-drive bicycle motor a decade ago, and a battery company called Dr. Power. The batteries used on the eProdigy are Panasonic 18650 cells, the same type used in Tesla automobiles. With the stealthy motor built into the bottom bracket, eProdigy chose to keep the battery mounted on the downtube and not inside it for a simple reason—they want it to be upgradeable and to be able to use a large-enough battery to offer a long range. The 11.6-amp-hour, 48-volt battery does just that, offering up to 60-plus miles on one charge. In designing the bike, they also didn’t make a frame-integrated battery, expecting battery technology to improve rapidly and making it easy to change battery types as better ones become available. The company’s philosophy seems to be to future-proof their bikes instead of building in obsolescence. They even have videos online to show dealers how to change out older 350- and 500-watt motors and controllers for modern 48-volt, 750-watt versions. An inexpensive bike that’s built to be fully upgradeable? Now that is a nice feature! We like that eProdigy also offers a two-year drivetrain warranty, which is a big plus. The motor itself is a unique design. Unlike most mid-drive motors that are large and somewhat square in the bottom bracket area, eProdigy’s is round like a normal, albeit larger, traditional bottom bracket. Test rider Stephani Kay had been riding the bike for a bit, but when she turned the power all the way up, she was really surprised! The bike itself is fairly simple in operation. It’s essentially a hybrid—a street bike with straight mountain bike-style bars and enough suspension in the fork to mellow out bumps. The bike does allow you to sit fairly upright. As soon as you start riding, you can feel how it encourages good posture. The head angle is pretty steep, making steering input very sharp. The display showed more detail than most we’ve encountered. Some people watch their range, but with this one, you can get into minutiae like precise voltage and battery temperature. Though it weighs in at 50 pounds, the bike is easy to carry and very easy to ride, with the weight of the motor and battery in the center of the bike and low. It accelerates smoothly and quickly, and even with the narrow 700c tires, the eProdigy tracks nicely and feels solid and planted. The tires do have light knobs on them if you want to engage in some light-duty off-road riding. Despite the video on their YouTube page showing a kid doing a backflip on one, the bike isn’t designed for mountain biking. When you start to pedal, power doesn’t kick in right away with the cadence sensor, so selecting the right gear at stops is important. When we did make mistakes in leaving it in too high a gear, a little extra throttle made that a lot easier. The throttle is on the left side, the only counterintuitive placement on the bike. Power-level input can be hard to see, but you instantly get what each of the three buttons do after you’ve seen them once. The fenders are a nice touch to keep water from splashing on you, but they’re plastic and a little flimsy, sometimes flopping around and touching the tires. The Topeak rack on the back is a very nice feature; we were able to carry groceries and equipment on it. Tektro levers with power cutoff are so common, we almost overlooked them, but they’re great and include a small bell on the left lever, so it’s always within reach. The brakes are mechanical discs and have a pretty mushy feeling compared to hydraulic brakes. If you’re lightweight and going slow, they’re fine. If you live in an area with steep hills and weigh north of 140 pounds, this is something to consider upgrading. Ergonomics are great on this bike. Grips are very comfortable, and every single control is within reach and where you’d expect it. We found the Velo saddle to be quite comfortable for longer rides. It has plenty of padding and is shaped to fit most people. The seatpost clamp has a quick release, which is great for making adjustments on a ride, but also something to be aware of when you lock the bike up. Thumb control for setting power is simple and very easy to reach. The whole system is so easy to understand and use, we can’t imagine anyone needing to read the manual, even with the abundance of information on the monochrome LCD. The display is a tech nerd’s dream. From time running and assist level to wattage to battery voltage to 1/10th of a volt, battery temperature and more, it shows you everything you need to know. Who needs range anxiety when you can go directly to voltage anxiety?! There’s enough on the display to distract you from the road if you let it, but we still found it really cool to know that level of detail on the display. EProdigy’s coaxial mid-drive is a unique one designed and patented by Jimmy Chan. It’s not the first iteration, and newer, more powerful upgrades fit in the same space and are easily replaceable/upgradeable. There’s a built-in cutoff for the brakes, and it also shows up visually on the display. A handy way to tell if you are putting too much pressure on the handles is if you rest your fingers on the brake levers while riding like we do. Mid-drive motors take advantage of the torque control you get with gears as you would with regular pedals. The 750-watt motor provides plenty of power. It’s not thrilling, but it’s consistent in its delivery, accelerating you up to 20 mph fairly rapidly. There’s just a single front sprocket that’s part of the drive system, and the mid-drive allows you to add torque when needed via the gears in the rear wheel. Though we’re not always a fan of mechanical discs, they are simpler and less expensive than hydraulic brakes. These Tektro units provided plenty of stopping power. There’s no torque sensor on this motor; it’s cadence only, meaning that just pedaling gives you power and doesn’t add power based on how hard you pedal. EProdigy has aimed this towards people who are not avid cyclists and who may or may not want to multiply their effort. This equates to a great ride for those who need more help with pedaling power, and you can even add in some throttle to get you going or help accelerate. The gear range on the Logan is perfect for most conditions, even in the hills. The motor can be tuned by your bike shop. For example, they can set the maximum speed, as well as be able to set the motor output to 350, 500 or 750 watts, all of which will affect your battery life and range. Lower power draws less current, but unless you’re really timid about speed, it’s better to always leave it set for maximum output and scale it back via the controls instead. Since it’s a mid-drive bike, you get all the advantages of torque control via the rear cogs. Shimano Alivio components were adequate. We weren’t getting quite as much range as their quoted maximum distance, but we also love using higher power levels. That’s what they’re there for, right? As with any electric bike, you want a bike that can easily get you to your regular destinations without fully draining the battery—and why not have maximum fun on rides too? This is a city bike with an innovative motor that, in our opinion, looks good and rides well. We enjoyed riding this one. With decent power and upgradeability, the Logan is a good bike for the price.